Swansea City head coach Francesco Guidolin believes his team have secured their Premier League survival after beating Chelsea. The Swans are up to 12th in the table, 13 points clear of the relegation zone. Having reached the 40-point mark widely regarded as a guarantee of top-flight safety, Guidolin thinks Swansea can start planning for next season. "Yes, I think so. It is virtual safety. It's not real yet but now we can see forward, not behind," he said. "This is an important message for us, for my players, for our fans, for the club." Swansea's win was their first in the Premier League against Chelsea since returning to the top flight in 2011. Gylfi Sigurdsson's volley capped a dominant first-half display from the Swans, who have now won four out of their last six league games. Guidolin, who succeeded Garry Monk in January, ranks the victory against Chelsea as the finest display of his tenure. "This is the best performance," he said. "I remember the first performance at Everton, the first half was very good, and we played well against Crystal Palace at home, but this is the best. "I'm very happy because it's my team, this is my team. "My opinion is we can play in this way since a long time but I am a new manager and I needed to know my players, all my players. "Today I saw my team play very well, with aggression, with quality." 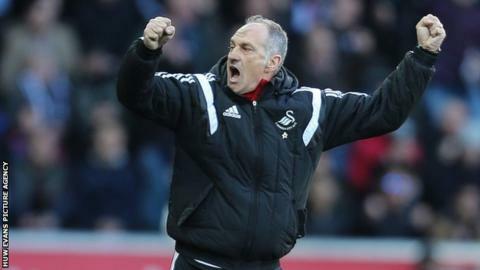 Prior to the match, Guidolin said he planned to discuss a new contract with chairman Huw Jenkins once Swansea had guaranteed their Premier League survival. Guidolin's current deal expires at the end of this season. Although that objective appears to have been achieved, the Italian said after the win against Chelsea: "This is not important now. I don't want to speak about this because I spoke enough. "My position is clear and now I am very happy because, three months ago when I arrived, the situation was not very good. Now it is a little bit better."